Yep - it's all done. Just around 30 days until it gets dismantled and I am already dreading that. Until then, we're surrounded by the spirit of the holidays whether we like it or not. 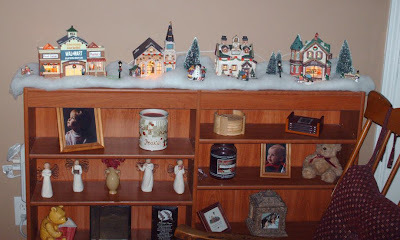 Christmas Village - my contribution is the building on the far left. No chimney - no fireplace. How will Santa get in? Supposedly, there were not going to be as many people out for Black Friday this morning. Wrong! 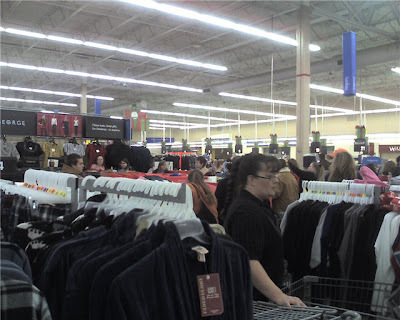 Here is the crowd at Walmart right before 5AM. Here's the herd all lined up and ready to go into Office Max. We did spend FAR less this year. There weren't a whole lot of "must have" deals. In fact - all of our purchases were pretty random. I got a few really good deals due to the Walmart Black Friday "don't want to put it in the backroom" rule. We went to the store at around 4AM for the initial onslaught. Then, we went to other stores. I went back alone to Walmart around 8 and they had already marked most of the Black Friday specials down another 50%! If it doesn't sell fast, it gets marked down fast. Well, Christmas shopping (and some birthday shopping) is done. We can relax. "You taught me everything I know about exterior illumination" - Clark W. Griswold (1989) How did you celebrate Thanksgiving? At my house, we celebrated with electricity - lots and lots of electricity. Almost done. The weird "tree of lights" is at least ten years old now. I also call it "Ol Sparky". I always warn the neighborhood kids to stay at least four feet away from it. "I dedicate this house to the Griswold family Christmas"
So, we've made it to the Tuesday before Thanksgiving. I'll be home tomorrow evening but tonight I'm sitting in a hotel room in Knoxville listening to the all-Christmas music station on the radio. Today was a good day. It was a pretty slow day work-wise (probably wouldn't have been if I didn't work some Saturday and Sunday - I don't like going into a holiday behind). So, here I am surfing the net - getting ready to hit the hay. 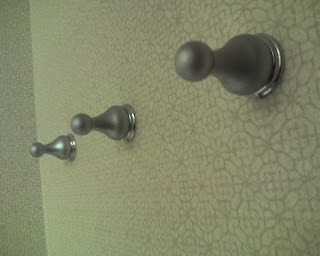 I did have one epiphany - I finally figured out why the towel holders in Hampton Inns look familiar. They appear to be oversized game pieces from Sorry. Now at Target - just in time for gift giving!!!! 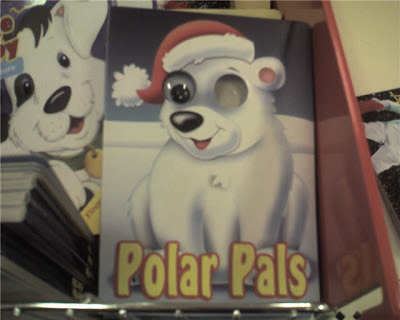 "Polar Pals" - by Sammy Davis, Jr.
Stay warm! Look like a cult member! Freak out the neighbors! I love when they go to a sports event wearing these. The first sign of insanity is buying one of these. If you wear it in public, it's time for the padded room. I never thought much about having theme entries, but I am going to try something new over the next few Fridays. I am going to post some old videos from "the vault" (actually YouTube or where ever I can leech off of). Let's start in 1982 with "You Can Do Magic" by America. I am a big fan of America and this was their last big hit. I sort of remembered the video. It's a great song but this video is - wow. 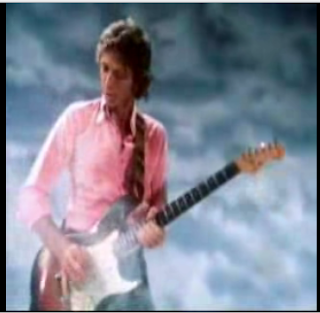 I am thinking they borrowed the wardrobe from Air Supply. He's a brave man. It appears that his guitar caught on fire yet be continued to play. Could have been the inspiration for Guitar Hero. Peter Scolari's brother was a member of America? O.K. It's not much. But, I am still convinced we are at the start of one of the first "real" winters we have seen here in years. We've had cold weather since the middle of October (last year I mowed on Thanksgiving), plus it will dip under 20 degrees tonight and we had our first semi-dusting of snow last night. Both of these events normally happen in January or February. My kids have not seen "real" snow. In the last six years, we've had 2 days where we have had around an inch and both times it was melted by the afternoon. This could be their year!! 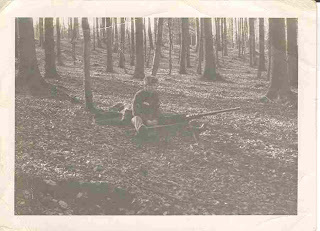 Thanks to Andrew for the link. How odd. 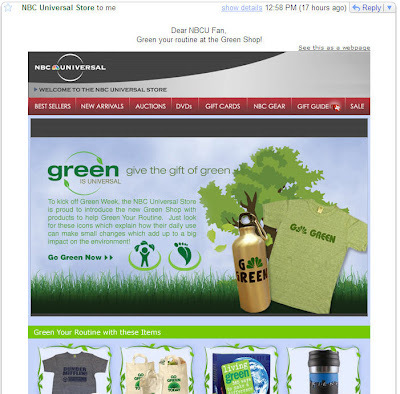 NBC sends me an email urging me to buy their green products.... ..at the same time that they commit America's largest annual tree murder. Somebody better call Al Gore. 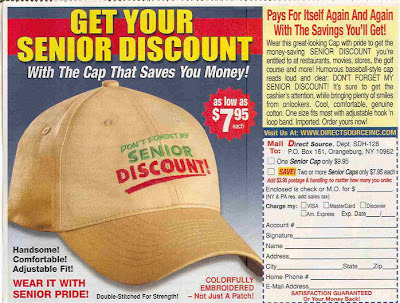 That's right - nothing says "I'm senile" like a hat that announces to the world "I am too old to remember to ask for my senior discount". It's got a remote control and the cool looking people in the illustration just can't help but laugh at how big a weirdo you are. If I see this in your house, I will also assume you are hiding bodies in the basement. I may buy both items for myself. That way I can put on my hat, break wind, and then point and blame it on the bear. 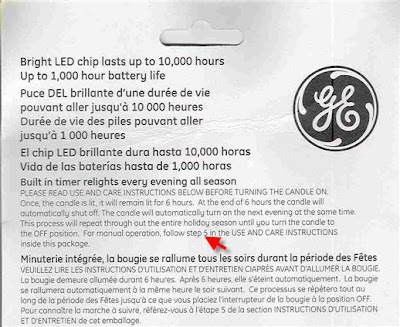 Got inside to the instructions and I guess that feature was removed after the packaging was printed! I was a fan of the comics for years and years, but when I stopped getting the paper, I also stopped reading most of the comics. I can still get them all online, but I gave up on most of them except for Funky Winkerbean (My other favorite was For Better or For Worse but she really kind of went off the deep end in the last year and she drowned that comic in puns before throwing it 30 years back in time). Last week there were a couple that really seemed to show a conversation I will be having with one of my daughters in 2017 or 2018... I think I already just lived this one when I took my kids to the alumni night at my old high school. Of course, this one nailed it. Sigh. I guess I can always be proud of the hundreds of pages of IT training manuals I have written for work!! This has been an unbelievable busy 3 days. We started out with Sara's birthday on the 30th. I wish shoes made me that happy. The kids took the 2008 John Kerry picture. The family John Kerry picture. Today was Sara's birthday party. Can you tell it was a High School Musical theme? And the cake and ice cream. Thank goodness it's over. I'll need the extra hour of sleep to work out all the soreness! !